This chapter helps parents understand how bullying prevention works in schools, where their children spend their days. It identifies how different bullying programs operate within “the three tiers of prevention” and explores anti-bullying policies. Finally, it shows how building a culture of respect is the solution. Q: Do you now understand the difference between the three tiers? Have you seen any of these programs in action? Have you seen others? What about programs like Squash Circles that were made up by teachers? Give examples of the three tiers of prevention in your community or school culture. Perhaps attention to one or more tiers is missing. This identifies where anti-bullying work needs to be done. You can approach school staff using this language and ideas from these programs. Q: How do teachers interact with students, and with each other, at your school? Do you know who the counselors are in your child’s school? Have you talked to teachers or the principal about your school’s anti-bullying strategies? Is the staff unified on procedures? Do adults use good manners with each other? Are there expectations of respect? Is there a culture of respect? Q: What did you think about the misconceptions of respect? Did they surprise/inspire you? Q: What sentence, paragraph, or idea popped out at you, or stuck with you after reading? Reply in the Comments, below! Looking for resource links? Click here. 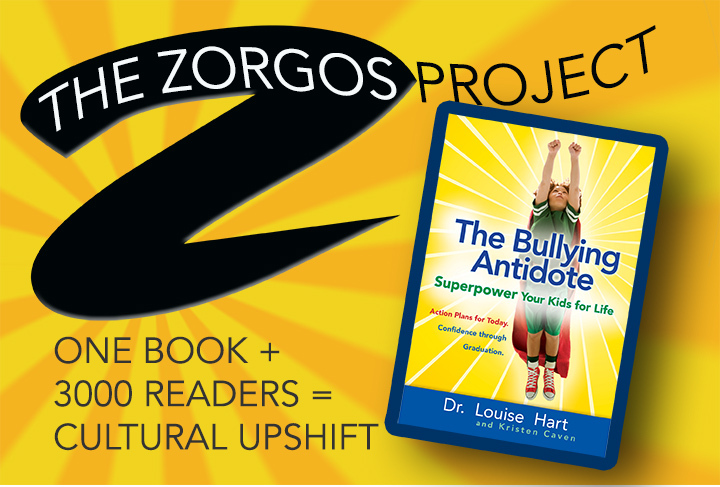 This chapter gets to the nuts and bolts of bullying events, and helps parents help their kids when they are bullying or being bullied. Q. In the section, “Interrupting Bullying Behavior and Providing Support” on pages 80-87, what advice surprised you? Which of these suggestions help to create empathy? Q. What can parents do to give their children the strength and courage to be upstanders? Q: What are some areas of your life where you can apply the 3:1 ratio and the concept of upward and outward spirals to create strength and resilience? What are some ways you can halt a downward slide, self-generate positive emotion, and un-do negativity in these situations? Q: On pages 95-96, twelve characteristics of mentally healthy people are listed, and on pages 97-100, six building blocks of healthy development are detailed. How are your children doing in each of these areas? Do you recognize any “holes” in yourself? This chapter discusses what bullying is and what it is not, the difference between the words ‘victim’ and ‘target,’ and the problems and conditions that precipitate bullying and violence. Q: Have you seen bullying situations in your life that have been read wrong? Have you known nice-enough kids or adults who have gotten caught up in bullying dynamics? Q: Considering the bullying continuum, so many incidents of violence have escalated from accidents, misunderstandings or wrong ideas. When have you seen that happen? Q: How many of these do you remember from being a child? Do you ever repeat them to your own kids? What are better messages we could give? Q: Conflict of every kind can be resolved. How is bullying different? Q: Are these habits common in your family or community? If not, what do parents do instead to get desired behavior from their kids? Change of plans…we are putting the online discussion guide on hold until fall. Meanwhile, Oaklanders are still invited to request free books and join us at Oakland Parents Together on Fridays! 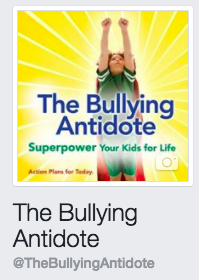 “Everyone loved your presentation & is excited to dive into your book!” That’s what the host of Kristen’s talk to Rancho Romero Elementary School parents said about her November mini-workshop, The Bullying Antidote: Raising An Upstander, Not A Bystander. Ask Kristen about bringing this 45-minute presentation & conversation to your school! 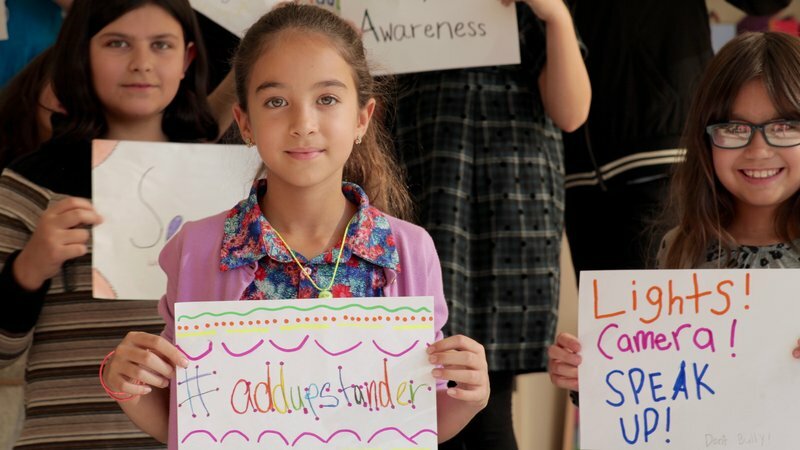 Now here’s something fun: sign this petition to add “Upstanders” to the dictionary!